1. Pop of Color Winter Coat: This adorable little pea coat comes in wide variety of vibrant colors including orange, blue, turquoise and fuchsia. A perfect little jacket to add a pop of color on a dreary winter day! 2. Dainty Key to My Heart Necklace: I love a perfect dainty piece to wear every day. This little key is just the cutest little touch to any and every outfit. 3. 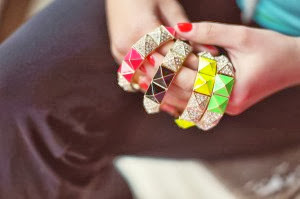 Designer Inspired Neon and Pave Bracelet: If you haven’t noticed, I love a pop of color to brighten my winter wardrobe. These gorgeous neon and pave bracelets would be the perfect addition to an arm party:) I especially love the neon lime and electric yellow. Plus, they are only $3! 4. Floral Printed Leggings: Printed leggings are a fun way to spice up a cozy sweater and boots. These floral leggings come in aqua, mint, white and grey and would be so cute paired with a chambray top, chunky knit scarf and a pair of combat boots! great items! I love it all.